They say men often marry women who remind them of their Mothers. When your mother in law is the late Princess Diana, It's quite a daunting prospect. 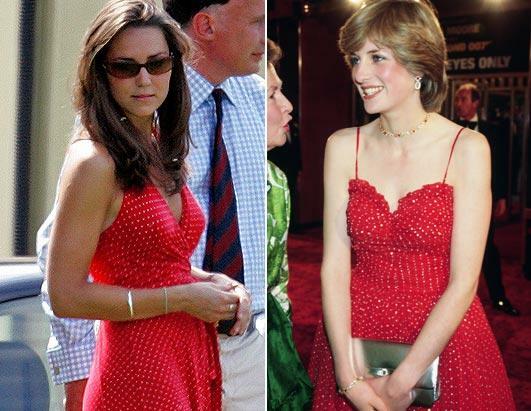 Physically Diana and Kate have no similarities apart from both standing at 5'10. Kate is dark, calm and collected while Diana was blonde, shy and generally unsure of herself. Kate grew up in Berkshire, Her parents a pilot and air hostess, Her grandfather's paid for her to be educated at private school, Later her parents founded party pieces which has seen them acquire millions. She graduated with a MA 2.1 in Arts from St. Andrews University. Diana's parents divorced when she was a child, A bitter custody battle ensued. Due to this Diana spoke of not wanting to get a divorce in order to save her children going through the same turmoil she and her siblings endured. She left school without any O levels and worked in childcare. Growing up with the title of Lady Spencer, Diana was always aware that the possibility of a royal marriage was on the cards. Diana grew up with a crush on Prince Andrew later transferring her affections to Charles while still in her teens. Kate met William at University and to her surprise a romance blossomed. Charles and Diana married when she was only nineteen, she found the media scrutiny and personal intrusion unbearable, Kate copes quite well with the media maintaining her privacy. Due to their long courtship Kate had adjusted to life in the spotlight long before marrying Prince William at the age of twenty nine. Kate is exceptionally close to her family, Often photographed with her sister Pippa and her mother Carole by her side. Diana faced uncertainty constantly while on overseas trips Charles rarely even called her. The crucial and critical difference between the two is the men they married. While William and Kate are obviously in love. Diana's marriage was doomed due to the Prince of Wales affair with Camilla Parker Bowles, As Diana said 'Three people in a marriage is too crowded' Without assurance and feeling unloved Diana resorted to self harm and began to suffer intensely from bulimia. Diana simply adored dealing with the public and despite her marital issues described herself and Charles as a 'great, great team' in public. Kate enjoys privacy and seems content to be a housewife announcing she will not participate in solo duties. Almost fourteen years after Diana's death are we ready for another people's princess? Personally I think Kate has all the necessary attributes, She appears to be modest, polite and without question devoted to William. The comparisons to Diana will always be evident, a woman adored by millions. Judging Kate thus far she will adapt a different role to Diana and ease into her royal duties over time. Diana loved her sons dearly and you can be assured she would be very happy for the happy couple now!